First I wish to greet the Lamas and everyone who came. Today is an interesting day. Usually I have a translator when I speak in public. 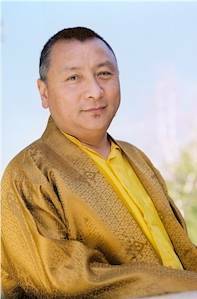 Many Tibetans found a new home in India and travelled with His Holiness the Sixteenth Gyalwa Karmapa in 1976 to America, Canada, and Europe. When we returned from New York in 1977 His Holiness instructed me to go back to America and to assist Khenpo Karthar Rinpoche and our President Tenzin Chönyi at Karma Triyana Dharmachakra; so we both grew up together with the Sixteenth Karmapa for sixteen years or more and both ended up working for this monastery. His Holiness asked me to join Khenpo Khathar Rinpoche and Tenzinla and help build Karma Triyana Dharmachakra Center in New York. Everyone has a different reason to emigrate to America - some people want to make lots of money, others want a good education by visiting good universities and later become learned and famous. For my part, I had and have a different aspiration. My root teacher, His Holiness the Sixteenth Gyalwa Karmapa, is very, very important in my life. When I was between 9 years of age, both my parents, my brothers and sisters, my whole family, our teachers and servants – we were thirteen in all - died while we fleeing and struggling to reach India. I was the only member who survived. I had just turned nine. You are informed about the historical situation of Tibet, so I will not speak about it. I wandered around and stayed in so many different places for a few years. Due to my family connection, I knew that His Holiness the Sixteenth Karmapa was in India. My family connection to His Holiness dates back 200 years, almost to the times when America was founded. Many members of my family had served to establish Surmang Monastery in East Tibet and contributed significantly to its historical worth for many generations, the reason why His Holiness the Sixteenth Karmapa had a very deep connection with us. He referred to my family as far as eleven generations back - he did. Not knowledgeable in the Hindi language, I really did not know what would happen to me at 9, all alone in India. It was a very different environment, but confident that His Holiness was there, somewhere, I did not lose hope and told myself, “If I can get there then I’ll be okay, I’ll be fine, you know. Even if I lost my family, possessions and home, if I get there I’ll be fine.” That is what I thought, and so just trying to get there was all that was left me. There were so many interesting experiences on the way. The Indian border to Tibet is very high and the military authority there was either a general or captain, in any case, he was one of the highest officers in that area then. The inhabitants of the border are Gyalkangpas, Tibetan people who have been living in India for quite some time, have taken on Indian citizenship, and live according to the Indian customs. They serve in the military and reach a high position. The Kangpa stationed at the border I had to cross really liked me and kept telling me, “You are too young to look for His Holiness the Karmapa, whoever he is. India is not a small country. India is huge. You don’t even have an address to go to, you don’t even know where to go, where His Holiness is now, so how are you going to find him? There is not much hope for you.” The officer continued, “Instead, you should become an Indian citizen. I can help you. I can talk with government officials in India. I will take you to New Delhi, introduce you to government officials there and they will send you to school. You can receive an education and study. Once you have a very good education, you can work for the Indian government.” The friendly Kangpa told me again, “This is not a small country. India is huge. If you have a good education, then you will be encouraged to make a good living.” That’s what he taught me, the giving instructions. And it is so true, arriving in a huge country between the age of 9 and 10, lost for a destination, his suggestion seemed like the only alternative for me. But deep inside my heart I knew the officer’s advice did not coincide with the connection my family had with the Karma Kagyu Lineage for so many generations, for more than 200 years. Not only that, scores of uncles, aunts and cousins had left their lives for the Karma Kagyu Lineage – the Sixteenth Karmapa mentioned more than forty, even fifty people from my family who had died for this Lineage, specifically speaking of my famous uncle, Gyatso Drola, whom he appointed personally to unite the Seratsang and Lingpatsang Monasteries (which divided the district of Surmang into two communities) under the auspicious guidance of the Surmang Monastery. Furthermore, my entire family travelled from Kongpo, our home, to the Tsurphu Monastery to request advice from His Holiness. Just when we were travelling, the communists subdued large portions of the Surmang district. I remember quite clearly that my father immediately sent the Karmapa´s message to the others travelling with us; he told them to flee from Tibet via Tsurphu right away. The exact message was, “We do not have much, but enough. We can all survive together. So please, instead of returning home, come here.” We agreed to do just as instructed after having completed our pilgrimage. His Holiness the Karmapa also advised that we go to Surmang and help at the monastery there. The Karmapa is our Root Teacher, so my family and relatives did as he said and have no regrets – we helped at the monastery in Surmang and most of those who stayed died while fighting to protect Tibet. You see why my family connection to His Holiness is very strong. The second incarnation of the Bardo Tulkus, my predecessor, also worked for the same Karmapa, the Sixteenth. At the age of sixteen, the former Karmapa went to Palpung Monastery and received the full ordination from Tai Situ Pema Wangpo Gyalpo; the Second Bardo Tulku received these ordinations together with the Sixteenth Karmapa, so they have a strong bond that links them closely. Instead of returning to his monastery, he went to Tsurphu, served His Holiness for a long time, while his monastery deteriorated in his absence. Requests poured in that Bardor Tulku return to his monastery until the day he passed away. The Second Bardor Tulku served the Sixteenth Karmapa very often and in many different ways and like me, at the age of fifty-six, I am still in the service of His Holiness by being in America, twenty-seven years now. I have a friend; we went together. He is a very interesting friend, and we have been friends for a long time, met again after a long time at the border. Now I had turned ten, he was eleven, so we went together. And then because of General Brigadir´s help ..… I don’t know, really. I was too young to understand, but he was the highest officer in the camp. He sent for two people who took us all the way to Bomdella - we were both in really safe hands. But the very same night we arrived, China and India started to fight; they kept bombing us, and we had to run again. We ran all night and finally, somehow, after a few days we ended up in Siliguri. The many Tibetans who had made their way to Siliguri wanted to go to Tsopema, the Lotus Lake where the Second Buddha, Guru Rinpoche, burned in the fire and survived. The Tibetan refugees wanted to visit many different places. Actually, me and my friend were the only ones who wanted to go to Darjeeling, which is not far from Sikkim, and we were determined to go. We kept repeating, “We don’t want to go to Tsopema. We want to go to Darjeeling.” Somebody at the border had a brother in Darjeeling, so he gave us a lift. His Holiness heard that I was there and sent somebody to pick me up – I had now turned twelve, and ever since then I was able to fulfil my wish, requesting that His Holiness pray for my family and relatives. I have been with him ever since. Instead of achieving a high position in India, I was able to return to the Lineage, can work for and serve the Lineage. That is what happened. Everybody has their goal, and keeping that goal in the heart is very, very important. What is today´s topic? The essence of Buddhism? Okay. In order to achieve the essence of Buddhism, you do need encouragement that you can do so. There is not much benefit in simply speaking about it. Lord Buddha 's teachings strongly emphasise the Buddha nature, the fact that all of us are endowed with it - no matter where you are within the six realms. All sentient beings - no matter how big or small - have Buddha nature. But the means to reveal the Buddha nature depend upon an individual 's encouragement, really, that is very, very important. As to the path, you are very, very weak, you are extremely weak when it comes to practicing the path and don’t really know what you are doing. You may be doing something good, but what you do doesn’t really help much. We need to do something that is fruitful in this lifetime. We need to do something meaningful. We may not waste this precious human life. Often people think that the life they have is very easy to get and that they do not need the Buddhist teachings. This precious human birth is very, very difficult to come by, and the coming together of positive causes and effects to achieve a human birth is rare. It comes about through the accumulation of what we did in the past - all the good, especially maintaining the discipline of vows, morality (tsul-trim in Tibetan). A human life is very difficult to achieve, in fact, very, very difficult. Once we have the human birth, it is most important to practice the Buddhadharma, the Buddhadharma which is like a boat. If you want it to take you from one shore to the other, you know, you have to board the boat, which is our precious human birth. This life is very, very important for practising the Buddhadharma and that is the main purpose of Buddhism. You do not want to waste this life. If you have a 24 carat gold container filled with preciously adorned jewellery – diamonds, rubies, and more – and put that container directly next to the entrance of your house, then you will use it as a wastebasket, you will naturally throw garbage into that container. How will others react? They will say, “You are crazy for using such an expensive container as a wastebasket for garbage.” They will make fun of you, but that is nothing in comparison to using this precious human birth misleadingly – far worse. It is very important to use things in a good way, in a correct way, especially if it enables us to really practice the Buddhadharma. A long time ago there lived a man called Drugpa Kungling. He came from Bhutan and was extremely learned, moreover, he analysed what he learned accurately and precisely and became a Mahasiddha. Some Mahasiddhas do not look too nice; they do not really fit into human society, aren’t really very clean, rather a bit dirty and unpleasant to see. Drugpra Kungling went to one of the many beautiful and clean shrines in a monastery that had a huge Buddha image - a gold gilt-edged Buddha image. He stepped right in front of the Buddha, remained standing upright, and stared at the Buddha. The people inside who saw him felt uncomfortable and asked, “What is this beggar doing here?” They didn’t know that he was a Mahasiddha, rather wondered what such an ugly beggar was doing in their beautiful shrine room, standing straight in front of the Buddha, not even offering a single prostration, just standing and staring. They whispered to each other, “What is he up to?” Drugpa Kungling just stood there and stared at the Buddha for a very long time. Finally he spoke four sentences, addressing the Buddha when he uttered, “In the beginning, you and I are the same." That’s what he’s said, “You and I are the same.” He continued with the second sentence and said, “You did it. With diligence, encouragement, you were able to achieve enlightenment, finally Buddhahood.” The Mahasiddha didn’t stop there but said, “I am still in samsara and for that reason I will bow to you.” He prostrated three times. That’s it. Whoever has encouragement and discipline, whoever is able to bear all negativities, whoever is able to accumulate all positive accumulations, that person will achieve enlightenment first. Who is not able to do so? We see why encouragement for anyone – for all of us - practicing the Buddhadharma is very, very important. Yet, having Buddha nature and having a practice is not enough. We definitely need encouragement in order to be able to really practice continuously - that is really important. To not waste this precious human birth is very, very important. One essence in the teachings of Lord Buddha is just that. Another essence of the Buddharma is generating Bodhicitta. One of the highest objectives in Buddhism is generating Bodhicitta. Whether you are receiving teachings, empowerments, reading transmissions, every Buddhist activity always begins with generating Bodhicitta. When listening to teachings, we think, “I am receiving this teaching today from this teacher in order to benefit all sentient beings.” Having a notion of what all sentient beings refers to is therefore also very important. Why? Since times without beginning, up to now, we are in the world of samsara that is marked by every imaginable defilement - that is for sure. We are in samsara with all the defilements included; it is like watching everything completely dreamy, clockwise - that is our present situation. Now we need to go counter-clockwise, not dreamy, counter-clockwise. And we have to become used to it. So far, we dreamt or our mind is completely emerged in defilements and we feel snug there, comfortable - we are really used to it. That is why we are in samsara. If we do not unwind this process, we are not going to be free - that’s for sure. We resemble a horse tied to a post; it can only go as far as the rope around it’s neck reaches, no further - that is just as far as the horse can go. Just like this example, as long as we are emerged in the defilements, no matter where we take birth (sometimes in gods’ realm where we enjoy much wealth, live a long life, can stay eon after eon), no matter how many eons we stay there, one day it will end. Likewise, sometimes we may be in the lower realms and experience a very difficult situation there; we may even land there for eons upon eons. The Jewel Ornament of Liberation by Gampopa discusses each realm of being in great detail, the duration of a life in each of the different levels of the higher or lower realms. You can read this book, it is available. So that is what is going to happen: if you do a lot of good and positive actions you can end up in the higher realms, which is still subject to the limitations of the rope in our example; one rope is shorter, the other is longer, but other than that difference, we are not really free from samsara - we are within samsara. Wherever we are born we are within samsara. So, learning Lord Buddha’s teachings and generating Bodhicitta are methods to cut the rope completely. We are trying to be free from the rope and generating Bodhicitta is one of the very, very important factors to accomplish this goal. But you cannot fake it - you have to be truthful when generating Bodhicitta. Often people think they can fake it and fool themselves into looking like a Bodhisattva by generating so much Bodhicitta, but this practice depends on the individual and not on how somebody looks . Somebody’s looks are very important when competing in a beauty contest; others just have to see you as a beauty wearing nice clothes, snazzy ornaments, modern shoes. Those things are important for someone competing, but if you genuinely want to practice the Buddhadharma, then looks are not important, rather only the inside counts - unshakeable encouragement inside, hundred per cent understanding inside, having really strong love and compassion for sentient beings, without partiality. The inside of your heart is very, very important - it is the essence of Buddhism, an essential of Buddhism. If somebody is very, very sick, has cancer or a similar disease and takes an aspirin or medicine against a light sickness, they won’t be healed of their disease, it doesn’t work. They need to be treated according to their sickness, they need a strong treatment against such aggressive diseases. They may not just take anything and hope to get well, so it is very important to receive proper treatment. In the same vein: We are in samsara, all the defilements included, which is like a heavy sickness, not a short sickness - we are talking about cancer, we are talking about one lifetime, no more. Once you are born, you are going to die. That’s natural. What’s the big deal? It may be nice to live long if it is useful for you, if you are able to do something good for yourself and others, if you can really serve and benefit them. In that case a long life is not only useful but also meaningful, not only meaningful but also fruitful, we can accomplish what we want to gain in this life, all in one. But if life is used negatively by harming others, then I would prefer to die. I would prefer to die than accumulate more negativities by living. If we live a long life and do negative things, that is very, very heavy-duty negative karma in the future, endless karma in the future. That is how I look at it. You know, the practice of the Buddhadharma is not carried out to show off - this is not for show. Dharma practice is really your own practice, trying to become better, more worthy, not some special somebody, not you, not trying to change somebody without knowing who you are. Not doing anything - you don’t know who you are. How are you going to change somebody if you are not ready to ask, “Who am I?” First of all, you have to have recognized yourself in order to really change effectively into somebody. So that’s why it is really important to analyse the Dharma. It is your own way first, you know: change yourself, make sure everything you do accords with the Buddhadharma, watch whether your thoughts accord with the Buddhadharma, check if your actions accord with the Buddhadharma. These are very, very important points, the essential points. Buddhism is helping you change yourself. Evolve into a Buddha in order to benefit all sentient beings. You see that Buddhism entails an enormous commitment. You will never find such a view in this world, but only if you really look and are honest about it. It’s a very large view. The minute you think “Bodhicitta,” you are not only addressing this small world, which is merely a speck within the hundreds of worlds we talk about. We do not restrict our attention to living beings in this world, but we address the limitless sentient beings, limitless as the sky, all sentient beings – you invite them to take part as guests, you offer to serve and help them. That is Bodhicitta. If you don’t have this quality, if you don’t have this understanding, if you don’t have this kind of encouragement, how are you going to help all the sentient beings inhabiting the limitless expanse of the sky? In the absence of the essential points, things sound like a joke. The commitment of Bodhicitta is not joking around; it is a real commitment, you are following Buddha’s steps, the Bodhisattvas´ steps, that’s what you are really following, to take the Bodhisattva vows, to generate Bodhicitta, which is like the strongest, most effective medicine against our defilements. But you know you must take the medicine appropriately yourself in order to cure a disease. Just talking about Bodhicitta and folding your hands is like taking aspirin to cure cancer. There is no way that pills against a headache will cure cancer or other life-endangering diseases. The Buddhist teachings are not like newspapers, which - if you read it once, then you can leave it in the corner – that does not really help anyone. You really have to analyse the teachings. If a newspaper reports that somebody was killed and invents tales to certify stories, there is nothing to investigate since you have only read that over is over, killed is killed, stolen is stolen, there is no meaningful message. But Buddhist texts are entirely different, very much different, even a text like the Bodhisattvacharyavatara. Somebody very knowledgeable may have read it carefully, but I can say with certainty that he or she does not know it fully. There is no way to know it fully. And then you listen to the teachings presented by the teachers, after that you read the teachings again and discover even more meaning from reading the same text or book. You discover an entirely different purpose and a new meaning opens for you when you read it again. You can read a book on Buddhism ten times and will definitely find more meanings when you read it again, and that’s what Dharma is all about. Many meanings are hidden, so without analysis, reading alone is not enough. Merely memorizing a book isn’t what analysis refers to. Analysis means day-to-day use, thinking about the meaning on a daily basis, examining yourself, thinking about how you are thinking, checking how your actions are going. Through that practice you will really be able to learn properly, you will really be able to make use of the teachings properly. This is very important, then the teachings will become very effective. If somebody who is sick with cancer receives the full treatment, they will have been helped. In the same manner, we have all the defilements, but are rarely able to genuinely study and analyse Bodhicitta so that it is the main medicine against a heavy disease, the defilements. That’s what we really have to use every day, not just listening to teachers and thinking the teachings are over when the teacher has finished speaking and then wander off into samsaric ways. That is of no help whatsoever. Particularly, if you don’t analyse what you have heard, no matter how much you talk about a topic, it doesn’t really help you. For that reason, really, the essence of Buddhism lies in whatever you do, whatever you are connected with. It is something you really have to take seriously, you know. That’s very important. So I think maybe that’s enough. If anybody wants to ask a question then I will try my best to answer. If anything was unclear because of my poor English, I would like to apologise. Question: Thank you for teaching us. I remember when you spoke about Drugpa Kungling you said four sentences, I didn’t remember the last one, the fourth. Rinpoche: “That’s why I’m prostrating to you. That’s why.” He has a reason, not just prostrating, but he has a reason, you know? Question: Rinpoche, when you were talking about having to study books, what’s the relationship? Is the book enough or do you need a teacher as well, and what’s the relationship? Rinpoche: It depends upon how serious a practitioner you want to become, you know. If you just want to get information, then just reading by yourself is good enough. If somebody wants to become a really serious practitioner, then reading is not enough - you need further steps. Question: It’s related but it’s not exactly what you were just speaking of. I’ve read your book on Nyungne (Rest for the Fortunate. The Extraordinary Practice of Nyungne: Its History, Meaning, and Benefits). I’ve done the practice and this is my opportunity to ask a question. I’ve done some Nyungne, then went on to have the most horrible year. Then I reread something else, like the ten qualities that can start if we make Nyungne a life-practice, that can start to develop. Then I went to page 72 where I see that if my inner attention, inner isn’t very fine, my attention inside is like an intention, you know, both wandering, then my practice is wandering. So because I 've then gone on to have a horrible year. My question is: I would like to keep doing Nyungne, but as I do more Nyungne, if I really want to go for it, can I expect my purification to be, if my mind is quite horrible to start with, my purification will be quite hard and, you know, I can expect some rough times. Or should, as my Nyungne practices develop and my practice develops with it, should it start to become perhaps more gentle and I’m not quite so …..? Rinpoche: Okay. I hope I understood your question, if not you can let me know again. So, Nyungne practice is also purification, a most effective purification practice, like Vajrasattva, very similar. If you look into the book, the benefit of the eight sets of Nyungne is immeasurable, so when you are doing that practice, if you are going through so many difficulties, a lot of times many of the teachers emphasise that that is good. Why is it good? You know, if somebody is doing practice and having a hell of a difficult time and it 's said to be good, then that doesn’t make much sense. I will give you an example: If you have a nice small plant and didn’t do anything for it, it can look like it is clean - right? - because everything is underneath, so it looks really clean and pure, but it’s not – there are so many things underneath, deep in there. You know, it looks clean on the top, but there is so much down there. If you try to clean the whole plant, then everything is going to show up. When you stood up from your seat, tried to sort out the mud or anything impure inside, it won’t look nice, rather really ugly, dirty, black. But after you cleaned it completely and everything settles down, then it becomes really spotless, you know. Likewise, when you are doing practice, sometimes your defilements stand out and you will have so many difficulties, that’s for sure. But again, encouragement is very, very important. A lot of times people lose faith at that point, that’s for sure, they lose faith and complain, "Oh, what’s going wrong? I practice as hard as I can and more defilements, more sickness, more unhappiness comes up. What help is the practice? Leave it be." Then they give it up, leave it as unfinished business, as an unfinished job, you know. So encouragement is very, very important. If you have strong encouragement, no matter what, no matter how much suffering is experienced, no matter how much unhappiness arises, it doesn’t matter. You continue with the practice and know, “I’m doing right. I’m doing correctly in the practice, so I want to finish.” If you are able to finish like that, then you become spotless. Okay? Question: My question is about generating encouragement. Would Rinpoche give some advice on how to generate encouragement? What gives one encouragement? Rinpoche: There are a lot of different ways. If somebody has an unstable mind, sometimes people have to change their mind a lot, you know. If you see something you want, then you think, "Oh, this is great” or “This is what I should do." The next day you see something else and think, "Oh, this is great” or “This is something I should do." So in that type of situation, there are millions of things to do, but our life is not millions, it is very short. You really need the focal-point, which is what you really wanted to do, what you really wanted to become. Then you need somebody, you know, you need somebody who really helps you to sort of put you on the line, so to speak, you know, put you on the line. I think you know. When you are taking the refuge vow, you know that you are taking the refuge vow and you see the Buddha as the teacher, the Dharma as the path, the Sangha as friendship, you know, those who are a friend, not for the negative, we have enough experience, right - we don’t need somebody to teach negativities, so you are already in there, you know, we all know how to do it. Friendship means you are looking for somebody who can teach you about the positive, you know, what accords with the Dharma, what accords with the Buddha’s teachings – purely something that accords with the Buddha’s teachings. One best thing we have in Tibetan Buddhism is all the Buddha’s teachings. If somebody is an authentic teacher, they are not trying to change Buddhism; they are trying to really explain the way Lord Buddha meant it, according to Lord Buddha’s wishes, which entails a great benefit. If you change one word to a hundred different things, you have different meanings, a hundred different explanations, and eventually you don’t really know which word is right, what is the right explanation, and then you lose the essence. If you lose the essence, if there is no essence, then that doesn’t really make any sense, you know. So one thing many of the realised teachers in Tibetan Buddhism did, they were able to maintain the meaning or essence of the Buddha’s teachings. So if you learn one thing correctly, then it is really a big help. But how do you learn? You have to learn from an authentic teacher - he is your special friend. Without that special friend, without that special friend’s guidance, you resemble a blind person - you really wanted to do something, but you don’t even know which way you need to go. So the spiritual friend is someone who is able to really guide you the best and shortest way and can pin-point just that to you. So I think it will be nice, then you might be able to settle down. Question: Rinpoche, talking about negativity, I guess that I’m not sure how to ask the question, but it has to do with the fact that often times we have habits and even though we are studying the Dharma, in our mind we keep having these negative thoughts, well maybe not even negative but we don’t really have wonderful thoughts either. And sometimes I wonder how much of it’s habit and maybe how much of it’s laziness, how much of it is part of who you are and that, maybe. I guess what I’m getting at is that I had a talk with a friend and we were talking about happiness and what it meant to be happy. I’ve found that since I’ve taken refuge, in some ways I’ve become much calmer and happier, but at the same time I think like, as was said earlier, it actually brings up a lot of stuff and you wonder whether you are ever getting anywhere, whether that, like you were discussing before, is just habit-energy that would be rising up or is it actually a whole part of that process, that you 've got to spit it out in order to understand? Rinpoche: Okay, I will try my best, if I didn’t understood then you can make me clear. Dharma, you know, Buddha’s teachings, why is Dharma here, why did the Buddha give the teachings? Did he knowingly give teachings on the Dharma to enable purification of the defilements? He knew that we all have defilements, that’s not a negative thing, you know. As long as you’re in samsara, you have to have a reason why you’re in samsara, why you ended up in samsara. Why? Because of the defilements. You know, without the defilements you would not be here. So it’s general, having defilements is very much general. And then, when you practice Dharma, sometimes you feel it more, that’s what you’re getting into, right? You feel it more. That’s because you are getting more. That’s because through your understanding you’re feeling more, and that’s the difference. We have hundreds of thoughts, this is an example. We have hundreds and hundreds of thoughts going on every minute. But someone who is not a practitioner doesn’t sense them and it is very natural for that person. When someone does “shamatha meditation” then they feel it and realize, "Oh, you know, I’m doing shamatha meditation but my thoughts are uncontrollable. What’s going wrong? I’m trying to apply the Dharma, the practice, and my thoughts become uncontrollable. What am I doing wrong?" My answer is: nothing, you are doing nothing wrong, you’re recognising the enemy. See, that’s the difference: non-practitioners don’t recognize their uncontrollable thoughts, you do. You feel it more, you realize that uncontrollable thoughts are there. And likewise, when you’re doing purification practices, you are more sensitive because you feel. Someone without a sense of Dharma doesn’t feel if he or she kills eight hundred people, you know, they don’t even feel sorry. They might think, "Oh, I did it. I’m so happy that I did it." There’s no sense or feeling for shame - they are numb, completely numb. But you have a feeling and that’s good. Question: I’m trying to follow the path of a Bodhisattva, and by following, a lot of what I know is from reading several books several times, and I understand what I am doing, I think, but is that as close to the essence of Buddhism as I can get or can I get closer? I follow, I understand the six items, that I seek to give. Is this as close as I can get to the essence that you were describing today? Rinpoche: That is the path, the six paramitas you’re talking about, right? You’re talking about the six paramitas or are you referring to six something else? Rinpoche: Okay, there are many sixes; it is so hard to know which six, but if you talk about the six paramitas, then practising the six paramitas is very good. You are on the Bodhisattva path, and one of the most essential things to practice is the six paramitas, especially for beginners. You 're not able to practice the higher paramitas, which are a little more difficult. That is the reason why lots of times the teachers emphasise the first paramita of generosity and teach that it is very essential. Ordinary people are able to develop and increase generosity. So starting from there, try your best to go through the paramitas. very important. Thank you very much. Presented in New Zealand in 2005, edited slightly by gh, responsible for any mistakes.